Clear shipping tape (with tape gun, if available). The smallest box possible, while leaving enough room for the pot plus one to two inches of cushioning material on all sides. Avoid using packing peanuts. They have a thin coating of oil which can get onto pots (and other crafts or artwork). They also do not help with the most important thing of all when mailing or shipping anything fragile, freezing the object in place, which we will be talking about next. 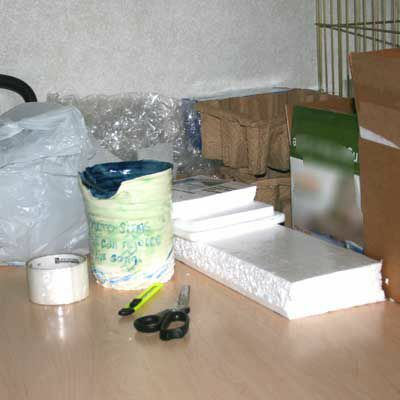 It is vital to "freeze" the pottery in place when packing it for mailing or shipping. The pot should not be able to move in any direction once it is in the box. It is for this reason that loose-pack cushioning material is not the best choice. Loose-packed material can shift during handling and transportation, which in turn can make the pot more likely to be damaged. The best choice is a box just big enough to fit the pot after it has been wrapped in several layers of bubble wrap. The bubble wrapping should be a minimum of one inch thick, or two to three inches for large items. Fill any open areas with more bubble wrap, solid pieces of Styrofoam, or wadded plastic grocery bags. 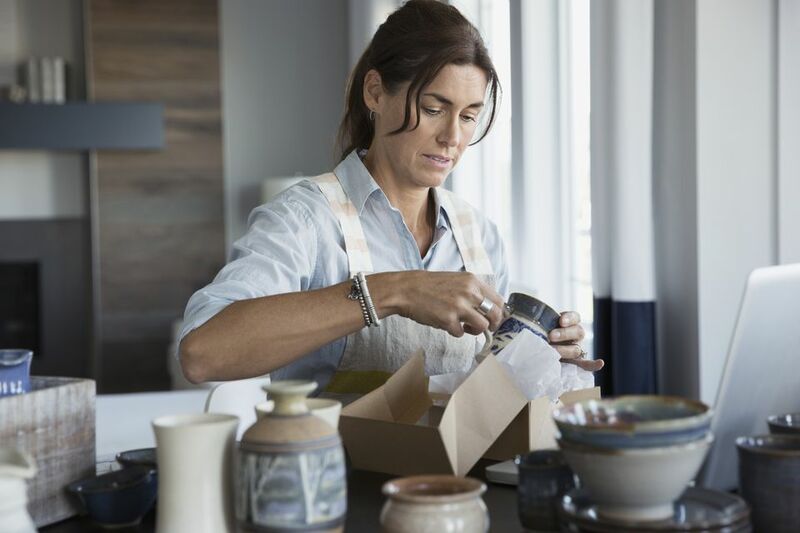 If the only box you have available is too large for the piece of pottery, it is very important that you fill the empty space in such a way that the pottery and its cushioning material cannot move inside the box. As you fill the empty space, add material so that the pot remains as close to the center of the box as possible. If you have sheets of foam board available, it can be cut to the right dimensions and layered to fill up the empty space. Other solid forms that have a bit of give to them can also be used. In the example photo, you can see that the pot is packed in a Styrofoam container (the cushioning material), with blue box on either side. Both these blue boxes were empty. We filled them with wadded plastic grocery bags to stabilize them, then taped them closed. Once inserted into the main box, they keep the pot and its cushion from moving side to side. The empty space at the top will be filled with more wadded plastic bags. There are times when you may want to pack more than one pot at a time. For example, the photo is of pots made by Rose (Pots4MyPlants on the Pottery Forum) shows how she packs pottery that she is taking to a show. Rose uses upholstery foam, bubble wrap, and heavy-duty cardboard boxes. Note how each pot is separated from everything else by a two-inch "sleeve" of solid packing material. This reduces the chance of pots breaking due to knocking against each other as well as the outside of the box. It also ensures a snug fit; freezing the pottery in place remains paramount. Once the pottery has been packed, it is time to complete the packaging ready for shipping or mailing. Before sealing the box, carefully look over each of its sides. Remove any old shipping labels, especially any that contain bar codes. Any bar codes or bar code fragments will confuse the machinery used to process your package. Close the box so that the top lays flat. Do not interlace the flaps. Make certain that the outermost set of flaps meet without gaps or overlaps. If there are overlaps, add more packing material until the box is completely filled. Holding the box firmly side to side and working at one end of the box, attach the shipping tape to the side of the box facing away from you. Draw the tape up and over the top of the box, keeping the flaps firmly in place. and down three to four inches on the side nearest you. Cut the tape free. Do the same for the other end of the box. Then, do the same following the seam where the two flaps meet so that the tape overlaps both sides of the seam. On the photo, the tape placement is highlighted with yellow arrows. You are now ready to take your packed pottery to the post office or shipping service. What Is Agateware and How Is It Created? How Does Paper Clay Build Stronger Ceramics?